1 of 5 Heat oven to 400 degrees F. Coat 10-cup souffle dish with cooking spray. Coat with the 3 tablespoons Parmesan. 2 of 5 Whisk milk and flour in saucepan. Bring to simmering over medium-high heat, whisking occasionally, until thickened, about 5 minutes. Remove from heat. Whisk in remaining 1/3 cup Parmesan, cheddar, mustard, salt and chives. 3 of 5 Whisk small amount of milk mixture into yolks in bowl. Whisk in almost half of milk mixture; whisk yolk mixture into milk mixture in saucepan. Pour into large bowl. 4 of 5 In clean bowl, beat whites and cream of tartar on medium until foamy. Increase to high; beat until stiff peaks. Fold half of whites into yolk mixture; fold in remaining whites. Scrape into prepared dish; smooth top. To make top hat on souffle, hold spoon upright and with back side of tip, make circle around mixture, 1 inch from edge of pan. 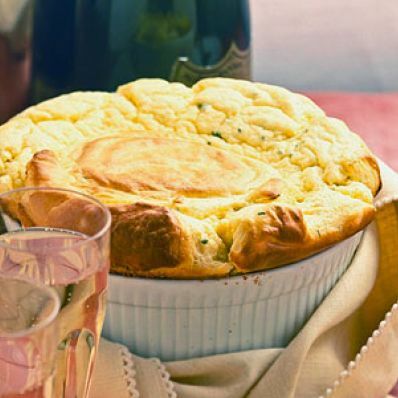 5 of 5 Place souffle in 400 degrees F oven; reduce temperature to 375 degrees F. Bake in 375 degrees F oven 30 to 35 minutes, until lightly golden, puffy and lightly set in center. Serve immediately.